Easter is traditionally a time when DIY enthusiasts get down to preparing the home and garden for the coming winter months. The hardware stores and garden centres will be doing a good trade this long weekend. It is noticeable that sales of Kiwicare products for the control of insects of all sorts have surged in the last month; this is one or two months later than traditionally. Our retailers such Mitre10, Bunning’s, Placemakers and Hammer have stocked up early for rodent control products. It has been noticeable that rodenticides have sold well throughout the spring and summer and this suggests to me that it has been a ‘bumper’ year for breeding of rodents. 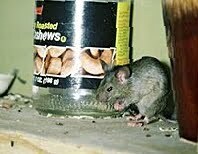 The result is likely to be a big influx of rats and mice to homes, offices, factories and farms when some real cool weather arrives. It is advisable to be pro-active and carry out a simple preventative plan now. I recently wrote a guide for the Yellow Pages on how to keep rats and mice out. You can check it out here. In the garden and outside the house it is a good time to tidy up and prepare the lawn for winter and to improve your home’s resistance to damp and cold. There have been a few nearly frosty mornings here in Canterbury and terracotta, concrete or stone pots on your deck should be protected from frost. Again I have written Yellow How To guides on these subjects, see here. Have a wonderful Easter break whatever you are doing. Kiwicare is a leader in home and garden product development and the team tasked with identifying new opportunities is asking for your help. We want to know what you (the customer) wants. If you have a suggestion for a new product or an improvement to an existing product we want to hear from you. Whether it is for the home, garden, office, farm or factory we would like to hear your ideas. Senders of the first ten suggestions that provide contact details in New Zealand will receive a reward of free product selected from the Kiwicare range. Get your thinking caps on. No suggestion will be disregarded. The 2009/10 wasp season has not been as bad as in many past years, in most parts of the country. This may be due to many areas having it too wet and other areas being too dry. 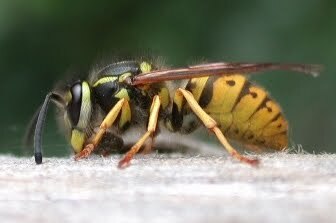 However, there are still wasps aplenty about and it this time of the year that they can be most aggressive. It is thought that they get 'angry' in autumn because they change their feeding habits towards larger amounts of protein and perhaps the workers know that winter and their death is coming. Nest and colony sizes are at their numerical high points about now and so dealing with a nest can be hazardous if not handled correctly. Do Not spray nests with liquids. Liquids tend to make wasps even more aggressive. Use powder type insecticides such as NO Wasps Insecticidal Dust or Carbaryl 80. Do Not use large amounts of powder. A number of light applications of powder is better than one large dose. Apply powder at dusk or at night on a dry day. Wasps will be less active. 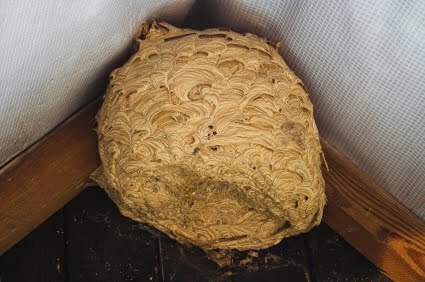 Avoid dealing with wasp nests on muggy dull days. Such conditions seem to make wasps aggressive. Puff or place powder IN the nest entrance. Worker wasps will walk the powder into the colony where it will kill larvae and queens. If the actual entrance cannot be accessed, several applications of powder to areas where wasps land and enter nest will be effective. If the nest is in amongst vegetation it can be difficult to identify the nest entrance. In this situation watch carefully to see where wasps enter the nest. Apply powder to the areas where the wasps land before walking into the nest. Once the nest is destroyed and no more activity is seen any excess carbaryl powder can be washed away or collected and disposed of safely. It is not necessary to physically remove a nest. Nests are not reused. Call Kiwicare at 03 389 0778 if need any further advice. Many of you will have seen the report last night's TV3 News programmes. I felt sorry for the poor lady that was sweeping up cluster flies that were about 2 inches deep on her floor. She was aware of the need to dispose of the bodies because they continue to emit pheromone. One of my ex colleagues from Target Pest was shown dealing with an infestation and I am confident he will have done a good job killing the flies and removing them. He will also have sprayed the roof voids, cracks and crevices where the clusters would form to prevent new groups forming. Clusters are likely to continue to form in various part sof New Zealand over the next couple of months. I recommend you get prepared now if you live in and area of pasture land. Spraying the exterior of the house (or other at risk building) and the warm dark spaces within will greatly reduce the risk of suffering an infestation. News of the early cluster fly invasion has reached the media. The Dominion Post has reported 'Wet summer brings a plague of flies' The reports suggests that Wairarapa, Manawatu and Horowhenua are the worst hit areas, but I know from the evidence of enquiries from many other parts of the country that the problem is much more widespread. The report says that professional pest management companies are being kept busy. You can deal with an infestation yourself by following the instructions in my last blog. Using residual (long lasting) surface spray to kill flies in existing clusters and treating the surfaces where clusters formed you can remove them and keep them away for the winter. Don't forget to treat the grass areas around your home with Lawngard Prills in spring so that you reduce the risk of clusters invading your home next autumn. Have you seen cluster flies congregating around your home or sheds already this season? Let me know by replying below. 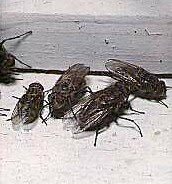 They are named cluster flies because of their habit of congregating in large groups or swarms in dark places such as attics, corners of dark rooms, 'nooks and crannies' and 'cracks and crevices'. Each fly releases a pheromone (smell) that attracts others. This pheromone will linger on even after all the flies have been destroyed and removed and thus will continue to attract cluster flies to that area so that the clusters keep recurring. It is therefore important that treatments are continued even when there are no flies present. These flies are an increasing pest in areas of grassland pasture or lawns. The larvae of the flies feed on earthworms and emerge as adults to mate. In autumn the adult flies congregate to survive through the winter and once warmer weather arrives in spring they emerge from their ‘hibernation’ to lay eggs on surrounding grassland, pasture and lawns. So there tend to be two times of the year that these flies bother us in homes and other buildings; autumn when they congregate and spring when they emerge from their hiding places. Kill the adults to prevent them laying eggs in surrounding grass. Kill the larvae in the grass to prevent the adults clustering in your buildings. If possible it is best to prevent the problem of these flies moving into your home by treating the larvae in the soil before they become adult flies. Use LawnPro Lawnguard Granules which is a slow release insecticide for removing pest insects from the soil. This is an ideal product to protect you from Cluster flies. Sprinkle these prills on grassy areas within 100-200m of your home. When cluster flies are seen around a building on the outside, this is usually in the late summer and autumn, this final adult stage before clustering inside can be controlled with NO Flies Bait placed in strategic places around the exterior. If you have the adult flies swarming and clustering in the house or other building you need to carry out a program of treatment. Check around your house/buildings for clusters of flies in warm, dark, dry corners specially your roof void and eaves. If these can be accessed, spray the clusters with NO Bugs Super. If the clusters cannot be found or accessed use NO Bugs Bug Bombs or NO Bugs Borafume fumigators in the voids. Once the flies in the cluster are dead, clear away as many bodies as can be reached. If you use a vacuum cleaner ensure the bag is disposed of immediately. Spray the surfaces they were clustering on with more NO Bugs Super to prevent new clusters forming where the pheromone lingers. Treat the surfaces around the home where flies have been seen and entry points to the roof void around the eaves etc. with NO Bugs Super. Treat again prior to the next season to prevent new clusters collecting. Given a chance they will use the same areas to form clusters. Why do flies follow garbage trucks? Because they like fast food. I have taken today and tomorrow off in lieu of working last weekend at the Flower Show. I have to catch up on the chores around the house; washing, ironing, vacuuming, washing car, reading, lazing........ I have now done the ironing and will be going out to give the car a clean after its days in the muddy car park at the show. Like many of you around New Zealand I have found that spiders like to set up home in the nooks and crannies around my car. I can wash the webbing off but the spiders will work overnight to rebuild them. I will today wash the car, let it dry, and then spray the wheels, wheel arches, engine bay, behind bumpers, in wing mirrors and around door housings with light coat of NO Bugs Super. 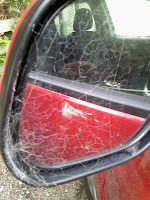 I will avoid spraying glass or polished paintwork but the spiders spend there time in the sprayed areas and I will not expect to have to wash spider webs off the car again for several months. What do you call a big Irish spider?Paddy long legs! I am very pleased to announce that the winner of the Kiwicare draw for the gift basket full of NZ Made products is Maureen from Christchurch. Maureen visited the show on Friday, i.e. the wettest day of the show. So her perseverance in tramping around in the wet and the muddy grass has paid off. A keen gardener with a new garden started five years ago she is pleased to have won several Kiwicare organic garden products in the gift basket. Maureen is pictured above on a bridge in her beautiful garden leading to her new planting of lavender. The Ellerslie Flower Show was a great success for Kiwicare. We had at least three people on the stand at all times and all of us were continually helping gardeners and home owners identify and solve problems. There must have been a big rush of people going to their local hardware and garden centre to purchase Kiwicare products. We also had many visitors from the hardware retailers such as Mitre10, Bunnings, Hammer, Placemakers etc. and the garden centres such as Oderings, Home & Garden and indipendents. There was a general interest in the expanding range of Kiwicare certified organic products such as outr new NO Caterpillars. I am looking forward to Fieldays which is the next show/expo at which you can visit us. Today is your last chance to visit this year's Ellerslie Flower Show. The weather is looking like being ideal with warmth and a little high cloud to keep us from the searing sun. The show has been a GREAT success if the comments of those visiting the Kiwicare site are anything to go by. Yesterday was the busiest day so far but I heard no complaints about overcrowding or long queues. There is so much to see and the exhibits are of such high standard that almost everyone I have asked has said they will be back next year. Christchurch has done a great job of putting on the Ellerslie Flower Show. Not surprising in the Garden City. Today is also the last chance to enter the draw at Kiwicare to win a gift box of goodies. There is wine, beer, chocolate, nuts, hand cream, soap, biscuits and several Kiwicare organic products in the basket. All Made in NZ. You can also go along to the 'Stump the Expert' session in the NZ Gardener tent where you will receive a Kiwicare product for stumping the expert or just asking a good question. If you come along to the Kiwicare stand and mention that you have read this blog and give the password 'NO Pests at Ellerslie' I will give you a free product. The weather at the Ellerslie Flower Show yesterday began with sunshine and I had hoped that the forecast rain would hold off for the day. Sadly my optimism was mistaken and the rain came earlier than expected. But gardeners are hardy folk and the crowds continued to enjoy the show and make the most of the entertainment and gardens on show. The Kiwicare stand was busy almost all day with people seeking advice on controlling pests and keeping their home and garden looking good. There was a lot of interest in Kiwicare organic products, particularly the new Organic NO Caterpillars. 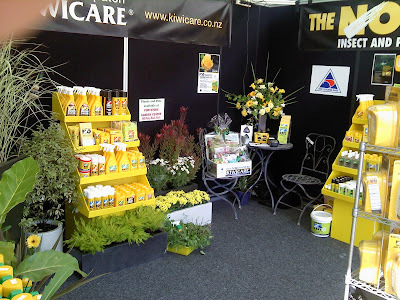 The NZ Gardener 'Stump the Expert' talks each day at 4pm have prizes of Kiwicare products. So go along and stump an expert to win some Kiwicare products. Today (Saturday) is looking like being a perfect day for visiting the show. The sun is out, the forecast is fine and it will not be too hot for spending the day enjoying the show. Good Morning New Zealand. 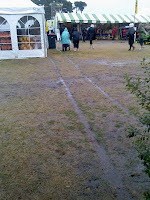 Yesterday was rather wet at the Ellerslie Flower Show in Christchurch. However, the weather did not stop the dedicated gardeners enjoying the show. Indeed the Kiwicare stand was maybe even busier answering questions and solving problems than on Wednesday. Today is looking like being a much better day weather wise. There may be the odd shower this afternoon but that will only serve to keep the dust down and there is plenty of indoor space and covered area to shelter while the showers pass. You could always come and visit us at Kiwicare. We will give you a warm welcome. The Pest Advice and the Garden Guru may even be able to help you solve any garden or home pest problems. Just a quick note to update you on yesterday and today at Ellerslie Flower Show. Yesterday was a very successful first day day at the show. Our team of five experts were frequently all involved in answering questions form visitors. The glorious weather brought out the crowds and everyone I spoke to waxed lyrical abut how great the show is this year. The highlights of the show according to most that I spoke to are the English Garden and the Life and Death fungi garden. Neither of which I have yet had time to go and see. Today the weather is looking like being a little cooler. Which may be good. I hope it will not put too many people visiting the show as much of the exhibition is under cover and you will still get a very warm welcome. Come and visit us at site CR6 and Be In To WIN a fabulous gift box full of NZ Made goodies. Well the Ellerslie Flower Show opens to the public today at 10.00am. Yesterday evening the show was opened for the awards ceremony and a garden party to raise money for charity. In glorious Christchurch weather guests dressed in their finery, relaxed and wandered around the site, glass of wine in hand. Today (Wednesday) looks like being another stunning day so I have slapped on the sunscreen and will be heading to the show to answer the public's questions on pest control in the garden and home. I hope I will see you there. Bring your hat. Twice a year, Hitwise awards the 10 most popular websites across some of our 160+ categories. From July - December, 2009, www.kiwicare.co.nz was ranked #6 in the Hitwise New Zealand 'Business and Finance - Manufacturing and Industrial' industry based on monthly average market share. This ranking relates to New Zealand based users visiting New Zealand websites. Ellerslie is creeping up on me. Today I will go to the site in Hagley Park to check that our site is ready for set up. Thanks to Portstone Garden Centre, of Ferry Road Christchurch for supplying a great selection of plants and pots for our display. I have had a couple of calls this week enquiring about how to deal with aphids on swan plants used for feeding monarch butterflies. One of the calls was from a large breeder of butterflies who claims that he has successfully used NO Insect Maldison to get rid of the aphids quickly. Then he washes off the maldison thoroughly. Lets the swan plants dry and then can put the caterpillars on the plants and they don't come to any harm. As maldison is non systemic I can see how this might work, but care would need to be taken to make sure all residues are removed. NO Insects Maldison is an excellent product for controlling aphids rapidly. Noramlly it would not be necessary to remove the product after treatment, unless you want to prevent harm to beneficial insects such as Monarch butterflies.